At the InnovateELT conference this year titled “Power to the Learner”, I asked the question, ‘What do students say they get from their teacher?’. I wanted to know how closely their experience aligns with what the ELT profession says about good teaching. I looked at feedback from about 100 students at Oxford House who were asked to write down three things they liked about their classes. The students are mainly Spanish / Catalan adults in a private language school in Barcelona in small groups at a range of levels including general English and exam preparation classes. So here are the top 6 most mentioned. You might be surprised by the results. The level of the class is good for me. The teacher corrects when we do mistakes (sic). Looking at these results my initial reaction was akin to that Eurovision song contest experience when some terrible dirge inexplicably wins and all the songs you liked are nowhere in sight. Do my years of classroom experience, ELT qualifications, dedication to professional development amount to nothing? Where is language awareness in there? What about teaching techniques, etc, etc, etc… None of this seems to matter. According to this feedback, I just need to be patient! Seriously? All I need to do is be patient!? When I reflected a bit more on patience and what it might mean, I calmed down a bit. I thought about the work of my daughter’s tennis coach and the hours of knocking balls back to her and her classmates. Patience includes empathy for the endeavour and encouragement when she gets frustrated. The Irish refer to one to one classes as “grinds”. This is what teachers do, we grind out results, we are patient. My daughter’s tennis teacher also gets a tick in the other five categories by the way. (substituting tennis for speaking in number six of course!) And his work is well done with those six areas covered. I wonder, then, why English teachers need more than six categories to assess their competence and why are we using language to describe things we do which doesn’t match what the learners call those things? Teachers say they develop communicative competence, students say they practise speaking. Teachers develop critical thinking skills, students enjoy discussing interesting topics. Teachers discuss mobile learning, students do homework on the bus. Teachers plan a task cycle, students have a conversation and get some correction. And so on. What would happen if we aligned the language we use to describe what we do with the language our students use to describe what we do? Imagine, for example, that the students’ top six feedback points listed above (or something like it) were the observation checklist for teachers on CELTA and DELTA courses, or chapter headings in Jeremy Harmer’s “How to Teach English”. Imagine teachers talked about teaching in a way that a B1 student would understand. Imagine that students as well as teachers and teacher trainers participated in giving feedback to teachers or even assessing them? Would that give power to the learners and would it be good for them? I am reminded of a line from a favourite band of mine from the late 80s, Carter USM, “If love is the answer, what was the question?” This makes a great substitution drill to start a conversation about why we and our students do what we do and what other options there are on offer to achieve the same aims. If the communicative approach is the answer what was the question? If an IWB is the answer what was the question? And so on. Let’s try one. Teacher A: If learner autonomy is the answer, what was the question? Teacher B: Maybe something like, how can we help students practise more on their own? How can students get more benefit from their time in class? How can students motivate themselves? Looking at this conversation it strikes me that teacher B’s questions are compelling in that they directly address practical concerns for teachers and students in clearly comprehensible language. The answer “learner autonomy”, therefore seems more mystifying than enlightening. Are English teachers overcomplicating when we describe and discuss what we do, taking us further away from each other, our students and an understanding of our work? If learning English is like learning tennis, why don’t we teach it that way? Should we be aligning our language (and thinking) with students to facilitate the inevitably collaborative endeavour of creating a language class? In this three-minute talk, Jack Richards, co-author with Theodore Rogers of Approaches and Methods in Language Teaching, makes his prediction for the future of teacher training and development. Has he been reading From English Teacher to Learner Coach? “Good teaching means preparing learners for learning both inside and outside of the classroom and that preparing teachers for this new reality will become more and more central in the training and development of language teachers.” We quite agree, Jack. Many people assume that a coaching approach can only be effective with one-to-one teaching. In this guest post Gabriella Kovács, a trained coach, describes a coaching technique she uses with group classes. Gabriella is an ACC, ICF-accredited language coach (Associate Certified Coach with the International Coach Federation) and business communication trainer. Her declared mission is to add dimension to ongoing language learning practices by introducing language coaching to organizations. She is currently supporting teachers to implement a language coaching approach in their day-to-day classes in Budapest, Hungary. Having worked as a language teacher for many years I felt it was necessary to specialize (which led to my holding business training sessions in corporate settings) and then move towards coaching. I have obtained international ACC accreditation by the ICF, currently the world’s leading coach organization. I coach and work with teachers in workshops, showing them how language coaching can be blended into the language teaching framework. I also have a series of interviews with language coaches on LinkedIn, including with Duncan Foord. I wouldn’t say I teach now, at least not in the sense that a teacher enters a classroom and works through the lesson plan, is satisfied that all points were covered and feels there has been a lot of teaching going on. If these five are fully satisfied, the learning will take place at a faster pace. Obviously this does not mean teaching is unnecessary and coaching is a magic wand to wave and hey presto. Of course not. If language users (rather than learners, because we are all learners, constantly learning, in all aspects of our lives) are aware of what is actually going on in their minds, what it is they need to achieve and what is preventing them from achieving more – then, by applying a coaching framework, by supporting and probing, they will find the missing pieces of their language learning jigsaw. They will realize that there is a learning zone out there where they can look for new challenges without flipping into a panic zone. The learning zone is everywhere and recognizing this is when true, intense development will take place in the mind of the language user. A new mindset will ensure that language issues will no longer be represented in the mind of the language user as problems and errors, but rather as challenges that can be overcome and option-seeking will become second nature. What is important to emphasize is that teachers can influence what is happening in the classroom and coaching can support what goes on in and outside the sessions. Each letter corresponds with the letters of a SWOT analysis. S = Strength, W = Weakness, O = Opportunity/Option, T = Threat. The additional two sides of the cube will be Es, E = Experience. In pairs or small groups, participants take turns to throw the cube. If they throw an S they relate a strength in their English communication, if they throw an E they talk about a language learning experience and so on. They can also ask each other questions of course. After a few turns they can relate something interesting they learned to the whole group. This activity creates a positive atmosphere, increases awareness of skills and can focus participants on where they are currently and where they wish to get to. This can provide a great springboard at the start of a course for students to formulate goals. Respond here or contact me on Linkedin – I’d love to hear how it went! Another guest post, this time from Claire Venables, who is based in Brazil and runs http://www.englishwithclaire.com. Claire shares the principles of Masterminding, the framework she uses, and some examples of how her learners are transforming the way they learn English. There is a quote that has been doing the rounds on Facebook that goes ‘You are the average of the five people you spend the most time with.’ This only made sense to me after I started a Mastermind group with four other motivated and determined colleagues. As our group developed, so too did the careers of the women in it. For those of you who have never heard of Masterminding, basically, we are a group of supportive friends getting together to push each other to new heights. The Mastermind format gives us a framework to formalize that support, to give and receive feedback, help to brainstorm new strategies, and create an accountability structure to keep focused and on track. Doesn’t this sound like the kind of environment you want to create in your classroom? It did to me and I started wondering if I could I adapt this same framework to empower my students. In this post I’m going to share the principles of Masterminding so you can see how transferable these are to the language coaching context. I’ll describe how my lesson is structured and the roles involved, and we’ll see examples of how learners are transforming the way they learn English with video diaries about their learning process, peer support, and learner-to-learner tips. Here are a few points about my group and what our meetings involve. This is the information we share with every potential new member and that I have started using in the first session with a new group of students. It helps make sure that everyone is clear about what group is all about and the level of commitment that needs to be made. One of the secrets to maintaining a successful group is definitely making a commitment to each other. That commitment comes in three forms: showing up to every class, being there for each other during the class and between classes when needed, and holding each other accountable for doing what you say you will between meetings. This is something that is essential in a Mastermind meeting and, when applied to my English lessons, has been incredibly empowering for the members of my group. Different from a traditional format where the teacher gives feedback to the students on their language production, the entire group gets involved with generating ideas and solutions and feedback. All members are there to ask for help and give help in a full and balanced way and this has transformed the dynamics of my lessons and really made the learners more actively involved in their own learning process and that of their classmates. Although this is something that should be obvious, saying this out loud in the first session makes such a difference. It is important to be able to make mistakes, share problems, goals, failures, fears and also celebrate success when we are together. We need to regularly remind each other that we don’t compare ourselves to the other or compete. These thoughts only serve to derail us from creating the mindsets you need to achieve your language learning goals. The learners may have different goals and take different paths to get there but what they all need to have in common is a deep belief in their capacity and a drive to become fluent in English. We all know how important it is to surround yourself with people who are motivated and love what they do. If you can cultivate this attitude in your learners from the beginning, it will continue to grow as the course continues. It is impossible to be an expert at everything and when learners recognize their different strengths and weakness with the language they can begin to pool their knowledge and share resources to benefit from each other. Do you believe that these are all things which you want or even expect from a group of students? Now, think about how often you actually make them explicit. I’ve found that by discussing these expectations at the beginning of the course, it puts them in the forefront of their minds and people make a conscious effort to follow them. Note-taker – writes a summary of the session, key points raised, tips, resources, agreed upon action points and new language. This person will write up the notes and share them in the email the next day. My students have found that having the responsibility for taking notes for the group sharpened their attention and focus during the lesson. Summarizing the lesson afterwards was a great way to force them to review and process their notes. Something they rarely did on their own. For those not having to take notes, it frees them up to participate more fully in listening to others and contributing in conversation. The rotating roles means that everyone gets a chance to benefit from this role. This is a screen shot of lesson summary. Time keeper – makes sure people are respecting the agenda for the session and will give people a heads up when it is time to move on. I have always had a timing problem in my lessons. This has been a great way of solving this! Hot Seats – The students in the ‘hot seats’ get to share their goals or challenges of that week. As there are only a maximum of 5 people in my groups, everyone gets to be in the hot seat fairly often. Students often have similar goals and challenges so, even when they are not in the hot seat, it’s often useful for them anyway. Aside from that, brainstorming and participating in discussions is great language practice and it helps to foster a learning environment where students support each other’s development actively. Moderator – This is me. I get the ball rolling at the start of the session and keep us on track throughout the session, contributing with my input whenever necessary. I wrap up the session at the end. I also monitor language production during the conversation and written activities and provide feedback and input. This is how my lesson is structured using principles of a mastermind meeting. Celebrate – What are you proud of? Creating a space to celebrate the small achievements really helps students reflect on and appreciate their progress. This in turn is great for motivation and makes the journey to proficiency much more enjoyable. Action point – People in the hot seats take turns to share their goal or something that is challenging them. This might be a specific thing they are struggling with or something they’d like to improve. For example, Thais was panicking about having to give a presentation in English at university and Melissa was frustrated with how quickly she was forgetting new vocabulary. What do you think the main challenge is? The members of the group can then offer their advice too. For Thais, they suggested ways she could improve her presentation and shared techniques for overcoming anxiety. Some of the stronger writers in the group offered to review her presentation and so she organized to email it to them for feedback. Melissa decided to record new vocabulary on her phone so she can access it easily when she has spare time and review it more often. Someone in the group suggested she use Evernote. I was able to provide input here about different ways to record vocabulary and show a few examples on the board. Here are some of the other activities that my students have been doing to improve their English between sessions. Encouraging students to create their own video reflections helps them improve on several levels. Having an audience means that they will really work on what they are going to say, looking for the right words and expressions, even writing out a script. Then they’ll video themselves, watch it back, evaluate their performance and record it again to improve as many times as necessary. This is great practice! Then, there is the process of reflecting on their learning, which is a powerful activity in itself. Rovena was having a hard time finding the courage to record herself speaking in English until her classmate Gabriel offered to help her. His may not be as fluent as Rovena but he feels much more confident in front of a camera. They pooled their skills and supported each other and made this great video. Rovena has begun helping Gabriel with his writing, a goal he has for his English. When students are invited to share a tip for learning English, it really makes them reflect on what is working for them. The making of the video has all the benefits we’ve already discovered. Watch the video to discover the strategy that Ana Sara has been using to improve her English at home. Masterminding has been a tool that I have used to transform my career and there are many elements of it that I am now using to enrich my learner coaching. Obviously, this is still very experimental and certainly doesn’t suit every teaching context. My learners are all upper-intermediate to advanced and have already spent years studying English. The goal of my programme is to help them make the transition from being English students to English users. What about your teaching context? What elements could you use from Masterminding to enhance your lessons and what would you have to adapt? Share your answers in the comments below and let’s discuss! Regardless of whether you do language coaching or not, I hope you’ve been able to identify some elements of the masterminding framework which you can transfer to your lesson and empower your learners! Designing CoachBot: can robots be language coaches? I come at language learning from the perspective of almost thirty years of non-native language learning and self-study in foreign languages. I was lucky enough to be exposed to a number of countries and the different languages that were spoken there while as I grew up, and that stimulated my desire to learn further. I was lucky to hav e parents who studied the language spoken in whatever new country we moved to, and this gave me the lived experience and confidence that learning languages was something that could be done. Like many in the United Kingdom, I studied a mix of European and classical languages at primary and secondary school, but none of these stuck in a particularly profound way. After I left school, I continued to study languages on the side, eventually shifting into a bachelor’s degree in Arabic and Persian/Farsi. After university, I worked on various research and writing projects that saw me living in Afghanistan. I had to tackle languages like Pashto, for which few materials existed at the time. I grew interested in materials tackling the meta-skills involved in learning languages and self-directed learning in general. My own personal struggles with language learning seem to revolve on finding ways to keep the process interesting, to vary the kinds of materials I’m using and consuming. I also often find it difficult to get started in my studies, so removing barriers to study is important for me. I also work as a language coach. I had done this informally for a few years and I noticed that I would often get similar kinds of questions from friends and acquaintances. Many (if not most) of the questions, had nothing to do with points of grammar or syntax, but were rather connected to things like motivation and accountability. This was especially true for students at the stage of the much-feared intermediate plateau. The problems that beginners face are, in some ways, much more predictable and mundane. There are some unavoidable hoops that everyone needs to jump through in the early days of learning a language – learning some basic grammar, phrases and vocabulary as a structure on which you can then build and expand further. It was thus gratifying to read From English Teacher to Learner Coach make such on-point observations about precisely these struggles. To bring all of this full-circle: I emerged after these years of studying languages and self-study methods with a strong sense of some techniques and approaches that would really benefit a learner working on their own to master a second language. I had been teaching myself how to code and thought I could combine a need to make a practical ‘experiment’ or prototype with my interest in language learning. CoachBot is a free tool I designed to deal with this problem. I have personal experience of the paralysis that can come at the intermediate level: there are too many options and you just need someone to tell you what to study and for how long. If you don’t want to do a particular task, just click to get a new one. Initial feedback has been positive, though the numbers using the service remain relatively small. I spoke with one student working on his French who had spent a whole month only doing exercises suggested by the CoachBot tool. My dream is to make this much more fully-functional and fleshed-out as a guide and language coach. Users will be able to store records of their previous study and the CoachBot will make recommendations depending on various parameters like whether they have been studying only one skill and neglecting others, for example. I continue to add tasks to the database on the back-end. I also use the tool in my own language studies. I’m currently refreshing my Dari and Pashto skills and the shorter exercises offer a great way to reacquaint myself with grammatical structures without feeling that I’m ‘studying’. Alex Strick is a writer, researcher and language coach. Visit https://alexstrick.com to read his blog and http://languagecoach.io/coaching to learn more about working with him to improve your own language skills. I’m pleased to introduce Phil Wade. Phil is an English teacher and coach specialising in business English. He’s also authored e-books on business English and is an active online member of the BE coaching community. In our first interview, he talks about his experiences teaching business English and how his approach has shifted into coaching. Phil, what’s your teaching background and how does coaching fit in? Hi Dan. Well, I started out tutoring university students and then worked for several language schools as a teacher and course manager, a few universities, some online organisations and I also sidestepped into examining, teacher training and e-learning. Eventually I felt like the skills I had from the CELTA, DELTA and the MA TESOL weren’t fitting in with what business clients wanted and several asked me for coaching. I was actually working at a coaching centre when I decided to sign up for an Executive Coaching course that then led me to the ILM in Coaching and Mentoring. Both have been valuable as they not only help me deliver what clients want but how too, they also provide me with a new perspective on all my teaching. Many things. I taught in summer schools and in schools with refugee kids before doing the CELTA so I knew what I needed. The CELTA helped give me that knowledge and essential skills. It also helped me get through the PGCE as we were never taught pedagogy and trained in teaching as a skill. When I worked in language schools, I found that CLIL, CBI, business English and ESP were becoming popular and fit my style better but my TEFL skills, born of teaching fun lessons to teens, didn’t fit. Thus, I had to adapt and I think the coaching seeds were set there. When I set up and ran an MA course, taught foundation and pre-MBA courses at a language school, I wasn’t doing TEFL anymore as students didn’t want it. By the time I’d moved into full-time business English client teaching, the whole ‘cultural trainer and ‘intercultural skills’ thing had been around awhile and teachers who had already rebranded as ‘business English skills trainers’ were starting to call themselves ‘coaches’. Due to the popularity of coaching, more and more business clients were exposed to it so it was no surprise that they expected language training with a coaching style. After I trained in Executive Coaching, I felt better able to fulfil what clients wanted and started to set up sessions like coaching ones and focus more on the client, talk less, extract more information from them, and just let them lead the session as they always had. I’d go so far as to say that all the managers and directors felt better in a coaching style situation than a TEFL one with copies, grammar, vocab and roleplays, basically, with ‘teaching’. Personally, I think it is because we’ve never had a business English method. Instead, countless people have said that any TEFLer can teach business English. They can’t, in my opinion. I think the key for me was that coaching gave me a different perspective, an analytical one in which I had time to interpret what and how people spoke, to figure out what they meant, to interpret information and work towards real personal goals to do with behaviour. 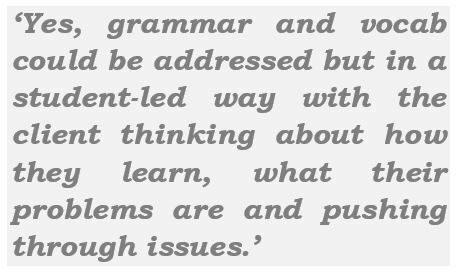 Yes, grammar and vocab could be addressed but in a student-led way with the client thinking about how they learn, what their problems are and pushing through issues. After all, like me, clients had been learning languages for decades. They had problems that were holding them back and needed help with. Fossilised errors for instance. When they went to some other teachers, they just learned and learned and practised. This didn’t work. It’s like having a hole in a car tyre, no amount of new air or driving the car will repair it. You need to fix the hole and move on. I’d like to move on to specifics. For teachers who may not be aware of what a coaching approach in BE is, could you describe one or two specific techniques or coaching tools that you employ with your clients? Well, I generally structure each session following the typical GROW /TGROW model beginning which really is almost DOGME, i.e. I ask the clients what they want to work on or recap and then agree on objectives for that session and maybe future ones. I started off using the SMART goals tool but soon got bored of them as everyone knew them and I wasn’t offering anything new. I then came across CLEAR goals (see here and here) which I found far more useful. I’ve found that goals change a lot so instead of deleting them and building new ones and then not completing others, CLEAR goals take into consideration that clients are part of teams and often their progress involves others around them. It also helps you discuss emotions and how they feel about where they are and want to be. My favourite parts, though, are that they are designed to break down the big goals into smaller and smaller ones. This is the key for me. There’s no point having 3 goals for 30 sessions. You need weekly or daily ones so people see achievement and improvement. Lastly, as I mentioned earlier, CLEAR goals are made to change, and change they do. As I see it, the modern executive is a change agent and so needs flexibility. Finally, what would you say are the key elements to get right in a coaching session? Firstly, progress. The same as in business English sessions. Where the latter is often based on language, skills development and confidence, coaching, for me, is more about feelings and that sense that the person has made internal progress which is deeper than at the surface level. In other words, a client who has the typical “I’m stressed and burnt” feeling can be helped reorganise their approach and develop some strategies but that is just dealing with the symptoms. The ‘why’ it happened and keeps happening will get you to personality and habits. If you can uncover those, encourage realisations, change those negative traits, then you will make a massive change in that person’s life. Otherwise, you’re just plugging holes in a dam with your fingers. Another big thing is listening and silence. It may sound ‘anti-coaching’ but I hate questions. In EFL communication classes, I’ve used books that just had 10 or 20 questions for pairs to ask each other. It sometimes feels like an interrogation, especially with introverts. It took me many months of dedication to change from asking lots of pre-prepared questions and from constantly filling the silence or jumping in before clients had the chance to create answers. Now, I understand the need to create challenging questions, statements or situations and know when I have hit something and clients go silent. Those are the golden moments and result in real answers and progress. This is the same as in class when you ask a very engaging question and students say “that’s a hard question to answer” then go silent. Finally is the whole idea of homework, which I see similar to the Flipped Classroom. To me, the sessions are just checking in time to find out what has happened since the last one and to address anything that has come up and then to adapt goals for next time. It is like the pit stop in Formula 1. This is why I quite like the online software or activities some company coaches use where clients fill in forms to book sessions, have them either F2F, on the phone or even by email and then fill in more after. That is something I would love to work on but I think my clients enjoy the F2F aspect more. I love the ‘pit stop’ analogy! Thanks, Phil. If we want to find out more about your approach, where can we look?